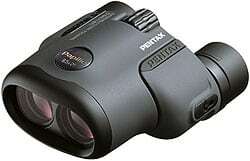 Imaging - compact and digital SLR cameras, interchangeable lenses and binoculars. IT - mask blanks and photo masks for semi-conductor devices and liquid crystal panels, optical lenses and glass memory disks. 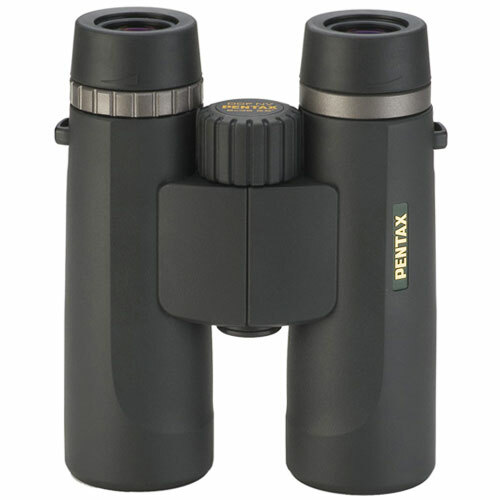 Pentax offer a wide range of binoculars and with many years of experience as a world leading optical instrument manufacturer, Pentax feature a good selection of high and medium quality binoculars with a variety of optics, magnifications and styles. They have both roof and porro prism designs. 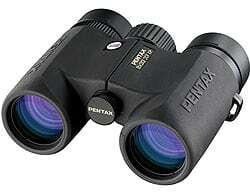 From the excellent top of the range Pentax DCF ED binoculars that feature extra low-dispersion, ED glass to the wide range of compact Pentax binoculars, that are good quality take anywhere binoculars. Marine binoculars come in the form of their PCF WP II Series, these full sized waterproof porro prism binoculars are ideal for use on and around the water, as well as for observations in harsh weather and extreme climates. Taking over, but still very similar to the now discontinued DCF ED, the new Z Series ED binoculars now fly the flag for Pentax Sport Optics as their most advanced range. The single bridge bodies are made from magnesium alloy that is both lightweight and durable. All ZD ED binoculars are completely sealed, filled with nitrogen and has a JIS Class 6 waterproof rating. Like the DCF ED series, these use aspherical lenses with extra low dispersion glass elements (ED Glass) to ensure the lowest levels of color fringing. The roof prisms are made from BAK4 glass and are both phase corrected and dielectrically coated and every single glass surface throughout the optical system has had multiple anti-reflection coatings added to them to ensure maximum image quality and brightness. The external lens surfaces also have a tough protective coatings applied to them that also repel water, dust and oil. Depending on which model you choose, they range in price from about $800 - $1200 in the US and £800 - £900 in the UK. 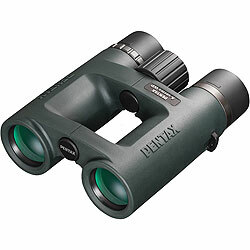 In terms of features and components, these are competing with the very top end end binoculars, but remain cheaper than many of the best known European brands. With a selection of both porro and roof prism models and availible in a range of different magnifications, the Pentax A-Series is a diverse range, but the one thing they have in common is that they all have objective lenses of less than 36mm. In terms of quality, they are one step below their flagship Z-Series bins and thus contain many high end features and optical components and are obviously aimed at those who want the extra convenience that you get from a smaller device, but who also are not willing to sacrifice too much in terms of the optical performance. 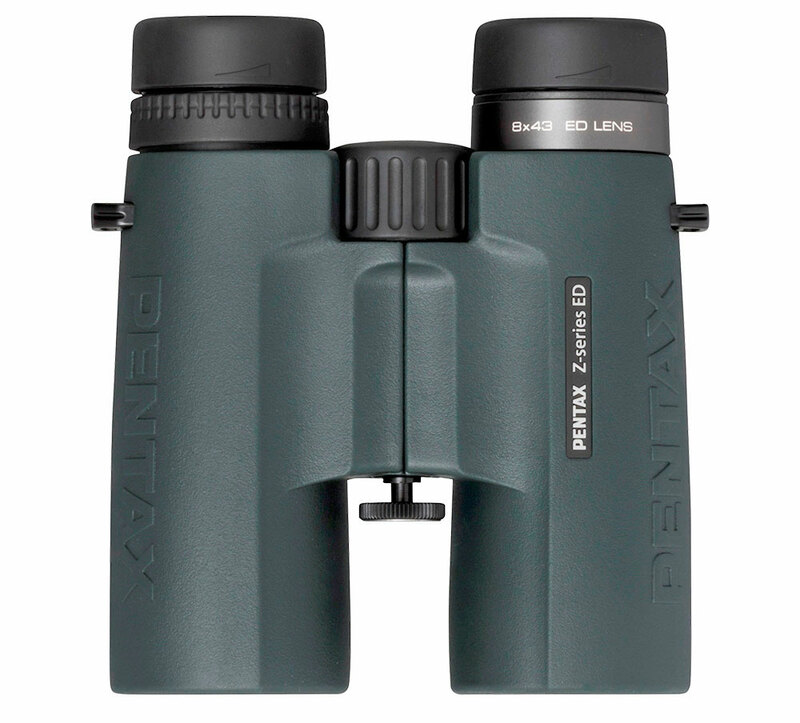 Now discontinued, the DCF ED's were once the top of the range binos from Pentax and so as you would utilize many many high end features, including fully multi coated optics that combine hybrid aspherical lenses with extra low dispersion glass elements (ED Glass) with full reflection and phase coated prisms. Built to last with they come with a tough, yet lightweight magnesium alloy body that is waterproof (JIS Class 6) and fogproof. The DCF ED binoculars also have a durable and a hard coating to protect exposed lens elements and their coatings. 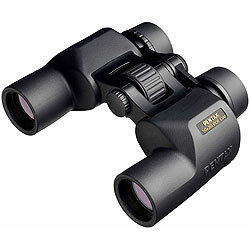 The DCF BR is another high end series from Pentax that currently only contains one model a roof prism bin with a polycarbonate open bridge body design with a 9x42mm configuration. High end features include fully multi-coated optics with phase coatings on the prisms which also have highly reflective silver mirror coatings on them. The body as you would expect is fully waterproof and nitrogen-filled but is tested to the JIS Class 6 standard and thus submersible to a depth of 1m. There is currently only one model in this series, the Pentax DCF BC 9x32 which has an ergonomic open bridge body and has been described by Pentax as a "gap-filler"
This is because it has cut straight through the middle of tradition with 9x magnification and is therefore aimed at people who are looking for more power than an 8x binocular, but also want a wider field of view than what you get with most mid-sized 10x binoculars in their price range. Quality optics include smc-fully coated lenses, phase correction and silver-evaporated coatings on the BaK4 prism. The tough polycarbonate housing weighs only 500 grams is fully water and fogproof and comes with 5-stop, helicoid eyecups. 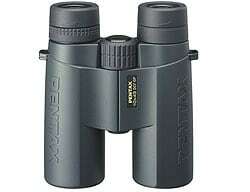 Pentax DCF BC 9x32 or Nikon Monarch 5 Binoculars for Safaris? 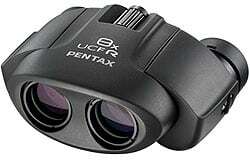 At around $250 (£300), I would say that the Pentax DCF BC 9x32 makes really good value for money. 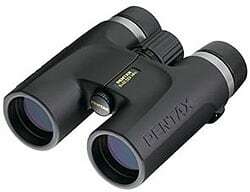 Currently there are two models within the PENTAX DCF NV series, an 8x36 and a 10x36. With their somewhat unusual 36mm objectives they can be looked at as either small full sized bins, or large-mid sized bins. 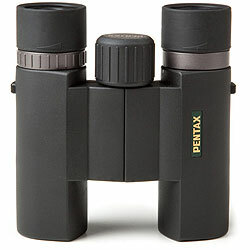 Pentax says that this gives you the ideal combination of a small size & low weight, but with bright optics that are thus ideal for all around use. Optical highlights include fully multi-coated lenses, roof prisms that have been coated with phase correction coatings as well as "super-reflective" coatings. There is currently only one model in the DCV LV series, the Pentax DCF LV 9x28 which is a rather unique compact binocular in that it comes with a 9x magnification that offers just a little more reach than the more commonly found 8x binoculars, but without sacrificing too much field of view. 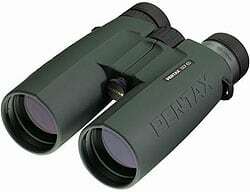 Quality optics include fully coated lenses, phase correction and coatings on the BaK4 roof prism. 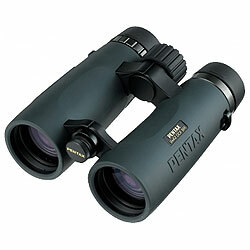 At around $200 (£175), I would say that the Pentax 9x28 DCF LV makes really good value for money compact binocular. In the Pentax PCF CW series, Ricoh are filling a niche that is becoming more and more popular. That is low costing, compact porro prism binoculars that due to their simplicity of the prism design have the potential to optically outperform similar priced roof prism compacts. I go over the details of this in my review of the 10x30 model (see link below). Features include a compact porro prism binocular with 30mm objective lenses, fully multi-coated optics, BaK-4 prism glass protected in a waterproof and nitrogen filled tripod adaptable body. Excellent quality at a great price, the nitrogen-filled bodies of the DCF XP series prevents fogging and condensation of the lenses in inclement weather. A very long eye-point allows for a full field of view for eyeglass wearers. The high resolution phase-corrected roof prisms of this series are convincing in their luminous intensity and brilliance. And the multi-coated lens elements provide for clear and high-contrast viewing. Every detail has been considered: the diopter adjustment has very fine click-stops to prevent unintentional changes. The unique inner focusing system means that the binoculars are not only water resistant, but fairly compact as well as lightweight. 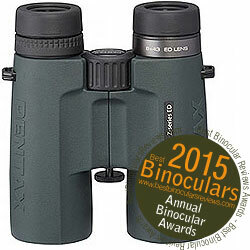 The DCF SP series of binoculars includes the very popular award-winning 10x50 DCF SP. They combine exceptional image quality with edge-edge sharpness and come with a long list of outstanding features including an inner-focus optical design incorporating hybrid aspherical eyepiece lenses, high-resolution phase-coated roof prisms, hydrophobic coating on exposed objective and eyepiece lenses, and multi-coated optical elements. Coupled with a magnesium-alloy body with JIS Class 6 waterproof construction, these high-performance binoculars are a great choice for those with uncompromising standards without an unlimited budget. Perfect for a wide variety of applications including birdwatching, safaris and other wildlife viewing as well as close-up viewing and use in less-than-ideal weather conditions. 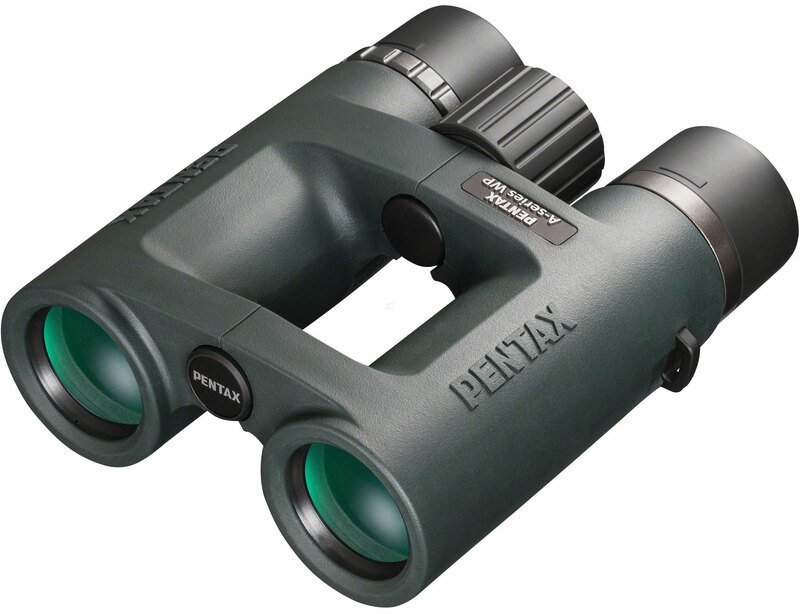 The PENTAX DCF HRc range of binoculars are different in that they are full-size binoculars, packed into a smaller package. With 8x or 10x magnification, large 42mm objective lenses for superior light gathering and a fiber reinforced polycarbonate body with nitrogen-filled waterproof (JIS Class 6) construction, these are easier to carry and perfect to use in tough weather and lighting conditions. 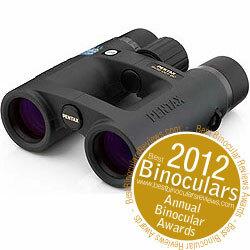 These pocket sized compact binoculars will go any where with you. Offering a versatile 8x and 10x magnification and excellent BaK4 prisms you can be sure of a closer view where ever you go. A somewhat different compact binocular in that they have a very close minimum focus distance of only 1.6ft (0.5m) which makes them ideal as binoculars for butterflies, dragonflies, bees and other insects as well as close observation of flowers or even paintings and other objects in a museum. To achieve this they use a unique image convergence system that moves the objective lenses closer together to allow for parallax and prevent the misalignment of the left and right image fields.